Our Director of Research, Dr. David M. Birch, has presented his paper on the development and uses of our micro-CTA at the 13th UK Conference on Wind Engineering in Leeds. This provides some details about ongoing research and development of our micro-CTA system, and its applications in the area of wind engineering. Typically, wind engineering research requires wind tunnels to run at very low speeds, either to match scales when working with models of very large things (like buildings and bridges), or because the temperature stratification (or layering) needed to mimic the Earth’s atmosphere needs huge amounts of power that increases even more with speed. We have demonstrated the capability of installing our micro-CTA units in models so that the sensors lie flush with an exposed surface. The sensors can then be used to make local directional velocity measurements at very low speed, with minimal interference. 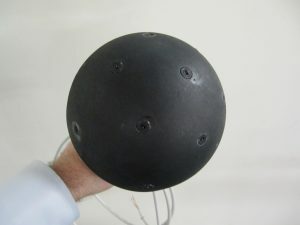 An additional application is that the same technology could be used in arrays, like the sphere shown below, to measure wind speed in the field- or, likewise, on the surface of a UAV to provide a measure of relative airspeed without the requirement of pressure-based measurement systems, which don’t work terribly well at very low speeds or in hover.